Villager Joe Debreus, left, and the Rev. Gerald Osterman serve as pallbearers in a funeral procession for 13-month-old Bethilene Buissereth. Editor’s note: It is difficult sometimes for reporters to stay remote from the stories they cover. The unwritten rule is you don’t tell readers how you felt or what you did. Sometimes it is worth telling stories a different way. aindes Benitha staggered up a mountain, her arms flailing above her head. With every step, she wailed. Behind her, the body of her 13-month-old daughter was carried in a tattered cardboard box. 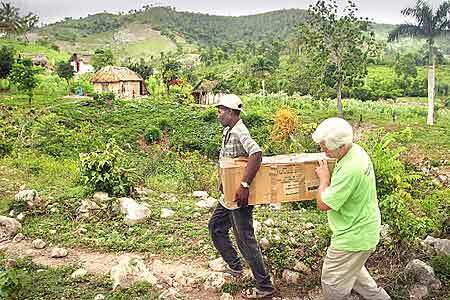 An American priest and Haitian laborer acted as pallbearers in the impromptu funeral march. The box had gotten wet, and packing tape barely kept it whole. The two men, the priest and the laborer, held the makeshift coffin tightly from the bottom for fear it would fall apart. All the while, a mother’s moans interrupted the morning silence. I had arrived the day before in Fond des Blancs, a mountainous agricultural region in southern Haiti. Some time in the night, as I slept in an apartment above St. Boniface Hospital, Maindes Benitha left her home. In complete darkness, she carried her sick daughter down a mountain and over dirt roads. The walk took three hours. It would prove too long. Bethilene Buissereth died of dehydration shortly after reaching the hospital. She had diarrhea. The next morning, seven of us piled into the hospital’s SUV to take Bethilene home to be buried. The road we were traveling came to an end, and the funeral procession continued on foot for several hundred yards up a steep, rocky hill. As we reached her house, Maindes Benitha’s screams mingled with the cries of her four other children. 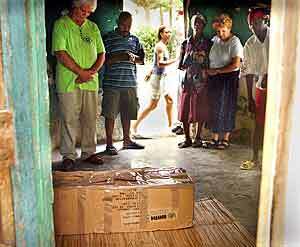 Brothers and sisters watched as baby Bethilene returned home in a box. Their mother fell to her knees. A moment later, Maindes picked herself up and went inside a simple concrete house to nurse her 3-month-old son. In Haiti, people seem to trudge on through the pain. I stood there, feeling like an intruder who had shoved my way into the most personal of moments. I couldn’t even say “I’m sorry” in Creole. The family crowded into the house to surround baby Bethilene’s coffin as the Rev. Gerald Osterman, a priest from a parish in Everett, said a prayer. I stood back, but Jean Phillippe Buissereth, the baby’s father, motioned for me to join in. As we stood there, a mix of English and Creole words floating through the room, I tried to envision the other children playing with their sister a day or a week or a month before. Daphne, 7, is beautiful, with an innocent face and wide eyes. Her hair was arranged in neat rows of braids. Jean Felix is 5; Natalie, 3. At 3 months old, Pierre Roody will only know his older sister through stories told years from now. I watched their faces and wondered: How do you explain to children that their sister died of a stomachache? The Rev. Gerald Osterman leads a grieving family in prayer. Afterward, as men searched for tools to build a proper coffin, Maindes Benitha insisted we stay for coffee. Her daughter lay dead in a box, her children were scared and confused, and she insisted on entertaining a group of strange “blancs,” the Creole word meaning “whites” and applied to all foreigners. In Haiti, making coffee involves physical labor. A thick, heavy stick is used to grind beans in a barrel. Up, down. Up, down. I watched, and could almost hear my doctor warning me not to drink the water. We waited for the coffee, and Gary Higgins, the Patriot Ledger photographer traveling with me, kept busy taking pictures of the children standing quietly outdoors. Nannette had told us the day before that some Haitians don’t know what they look like. Mirrors and cameras are rare in the back country. The children’s eyes grew wide with fascination as they looked at images of themselves on the camera’s digital display screen. They smiled despite their sadness, and Pierre Roody, naked from the waist down, spit up as Nannette bounced him on her lap. The coffee came in miniature white cups that could have belonged in a child’s tea set. I wondered how I could discreetly dump it out. And then came the rain. Not a few drops, or even a steady drizzle. The water pelted down in heavy, almost angry, streams. We filed back into the small, concrete house, and as I stood next to the cardboard box where little Bethilene lay, there was nothing to do but watch the rain. Her father politely offered me his chair. The thought horrified me. I was stuck in a house in rural Haiti with a family of strangers, a dead baby and coffee I couldn’t drink. I’m embarrassed to admit it, but one thought that came into my mind was that I didn’t have my bug spray. The rain finally did stop, and as we said goodbye, the family thanked us again and again. I stared at the house where I was afraid to spend the night and realized these people spend their lives here. For me, Haiti was a blip in a world of air conditioners, big-screen TVs and dinners out with friends. In their world, children die of diarrhea. And yet on this day of unimaginable pain, they made me coffee. They offered to stand so I could sit. They smiled and thanked us just for coming.